On December 26, 2008, a foundation laying ceremony was held on the construction site. Construction started in March 2011, and the last panel was installed on the morning of 3 July 2016. Originally budgeted for CN¥700 million, the final cost was CN¥1.2 billion (US$180 million). Testing and commissioning began with first light on 25 September 2016. Initial observations will take place at lower frequencies while the adaptive primary is brought to its design accuracy; longer wavelengths are less sensitive to errors in reflector shape. It will take three years to calibrate the various instruments so it can become fully operational. Once it does, it would likely require hundreds of astronomers. 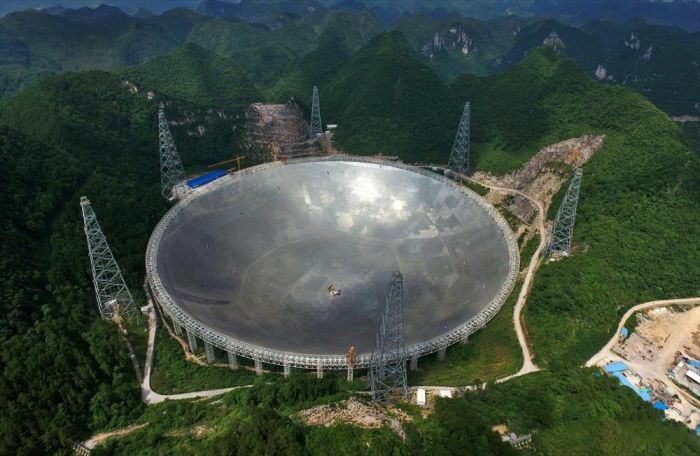 However, due to the shortage of astronomers, the telescope would not operate at full capacity for a long time. Local government efforts to develop a tourist industry around the telescope are causing some concern among astronomers worried about nearby mobile phones.